I'd like to preface this post by saying that I filmed this tutorial last year—the day before I whacked off 12-inches and donated my hair to charity. Looking back, I don't regret my decision to opt for a shorter 'do one bit, though this does make me miss my longer hair. This messy bun is my go-to look for 2nd (or 3rd or 4th!) day hair. Though my hair is currently shoulder-length, I can still do a bun like this—I just have to modify the steps a little. My favorite part about this look? 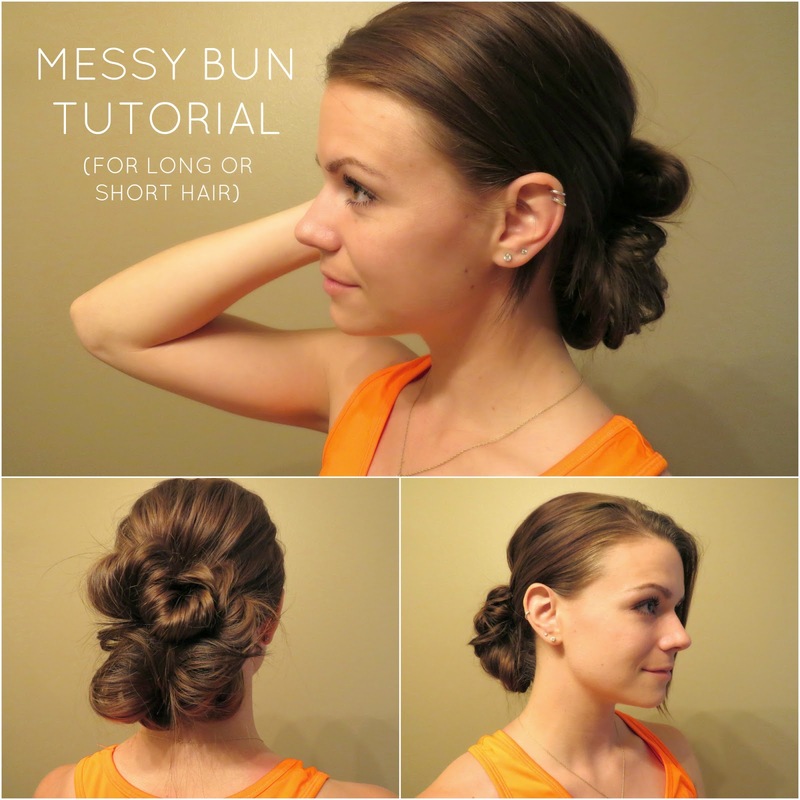 That it's a messy bun—it doesn't have to be perfect and will look different each time you do it. If you're trying this look on shorter hair, that's no problem! When you make your bun, skip step 2. Instead, twist and tuck the loose ends into your hair tie above your bun, creating what looks like a mini bun on top. It will give that "double bun" effect. And then, just like in the tutorial, pull & tug to add volume and secure loose pieces in place. I used this same method to create this bun and this bun on my much shorter hair. I love this tutorial! Many hair tutorials I find aren't helpful … but yours was super easy to follow! Thank you!! So cute! I'm going to have to try this! Cute! Just pinned and I'll be trying this! I hope you do, and that it works! Thanks Alana! This is cute! I tend to do the same thing every day, so I'm always looking for something new (and easy) to try - especially because I'm pretty much the LEAST coordinated person in the world. Thanks for the tutorial! I've always wondered how people do such cute messy buns and had pretty much given up on them until now. What kind of brush did you use to tease your hair at the beginning?